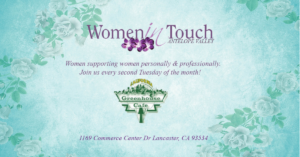 The next Antelope Valley Women in touch LADIES ONLY Breakfast is: Tuesday 02/12/19. Start your Valentines month with Women in Touch! We’ve got Julie A Shelton with The Alexander Technique of Valencia, self-care for improving posture and movement, reducing stress and eliminating pain. Our breakfast sponsor message will come from Myrna Jackson of on Queen Status!